Although the Idle No More movement may appear to have disappeared from national media coverage it is still active in many communities including that of Simon Fraser University. On Monday, April 8th SFU students, alumni, faculty and staff came together to hold an Idle No More rally at the Burnaby campus. The global grassroots movement is aimed at bringing attention and resolution to the many longstanding Aboriginal economic, social, human rights and environmental issues. The free public event invited both Aboriginal and non-Aboriginal community members from both the university and beyond to join the peaceful protest-style rally and show their support. Several organizations on campus came together to make the event a success including the First Nations Student Association (FNSA), Simon Fraser Public Interest Research Group (SFPIRG), Women’s Centre and the Office for Aboriginal Peoples (OAP). Other university groups that supported the event with their presence were Out On Campus, CJSF Radio, the Indigenous Student Centre and Sustainable SFU. 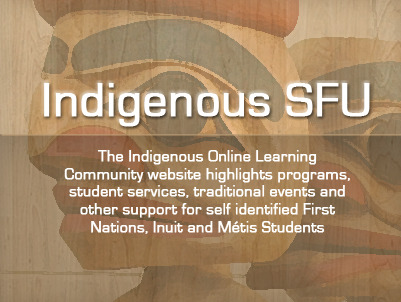 “We want to educate the general SFU population about Aboriginal peoples today, our histories, and also to raise awareness about the many common misconceptions about Aboriginal peoples that are prevalent in our society” said Lindsay Wainwright. The SFU biology student and FNSA Board Representative was a key event organizer. The event started off with a heartfelt prayer from SFU Resident Elder Maureen followed by moving speeches from four local Aboriginal women to celebrate Idle No More movement founders. Throughout the day various speakers from both the SFU community and abroad gave inspiring insight into topics ranging from Aboriginal sovereignty, racism, decolonization, women's rights and environmental protection. The speaker list included Jennifer Allen, a well-known First Nations human rights advocate and Wild Salmon Warrior, Jay Peachy, founder of the organization Salmon are Sacred which serves to educate the public about the dangers faced by wild salmon due to fish farming and habitat loss. South Dakota Drum Group was present throughout the day providing attendees with traditional drumming and singing. Watch a video from the event.